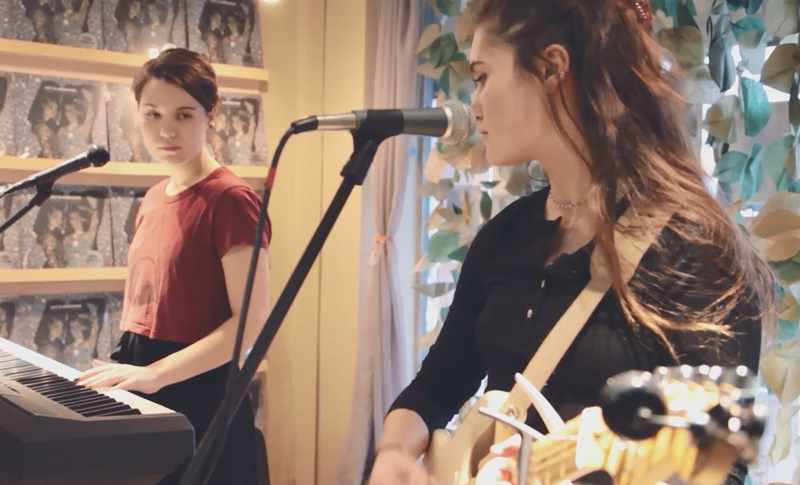 Earlier this year local duo Lily & Madeleine took a break from touring behind their newest record, Keep It Together, and graced LUNA music with a stripped down instore performance. The Jurkiewicz sisters packed the storefront with as many friends and fans as could fit inside and treated them to intimate versions of a handful of new songs, including “Small Talk” and “Nothing,” the two closing tracks off of their latest album. The shuffling guitar and piano of “Small Talk” provide a glasslike canvas that let the vocals on the song shimmer through, showcasing the understated beauty of Lily & Madeleine’s marvelous harmonies. On “Nothing,” though, a melancholy piano line is the only accompaniment to the sisters’ stark and haunting voices. The band deals with themes like heartbreak, self-reliance, and others commonly found throughout modern music, but it’s the honesty and arrestingly beautiful voices that Lily & Madeleine craft their songs with that make them stand out. Be sure to catch them on the rest of their North American tour from now through October. I shot video of the entire in-store at Luna that day (2/26/2016). Bought “Keep It Together” on vinyl and got autographs on noth the album cover an a cool poster, advertising the Luna in-store. Awesome…saw them debut “KIT” the next night in the Deluxe Room at Old National Centre.